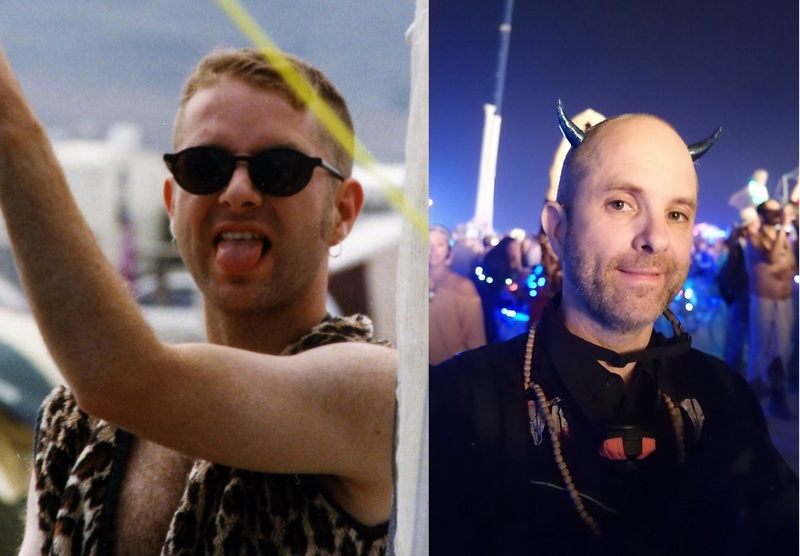 I’ve been to Burning Man sixteen times, first in 1995, and most recently, this year. 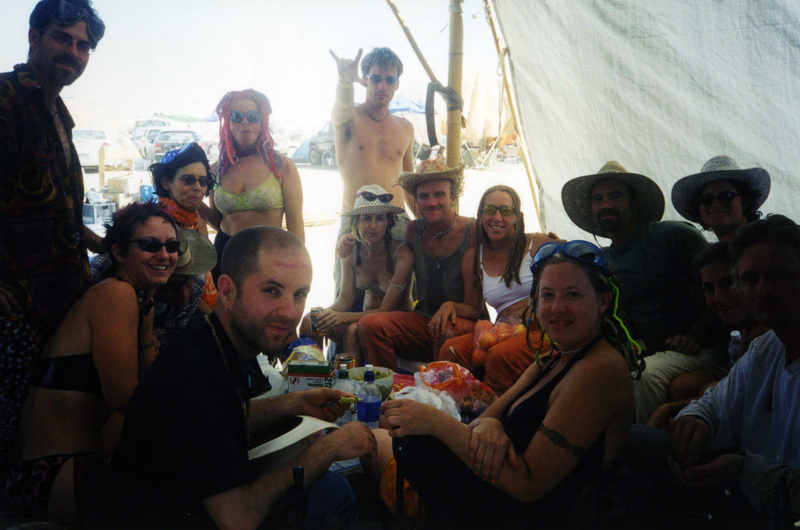 Years back in my BM history, in the early-to-mid 2000s, large groups of my friends would go out to Burning Man and we would create huge camps together. Many of those friends have not been back since then. This post is intended to share with those folks how Burning Man seemed different to me this year than it was back in those years, although this writing is hopefully of interest to other people too. 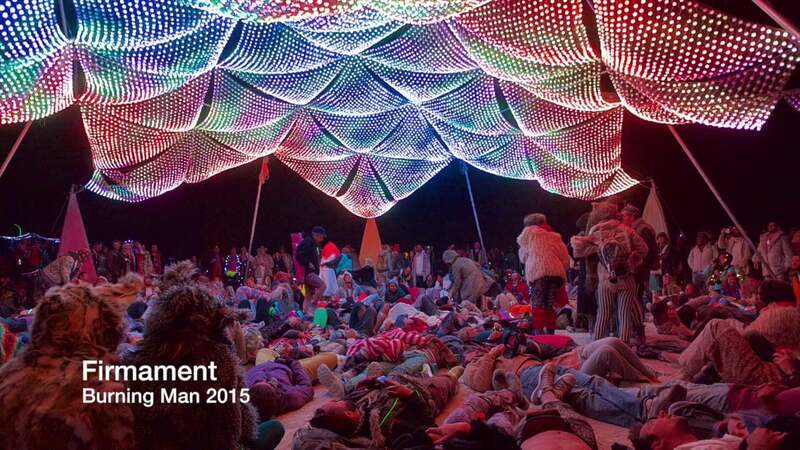 It feels to me that Burning Man changed more between 1995 and 2000 than it has since then. If a person attended in the early 2000s and then came back again for the first time this year, I imagine that the event would still feel mostly familiar. And, in many ways, Burning Man feels the same to me even going back through all of the years that I’ve attended. It’s still a deep, rich, and profound space of external radical self-expression and internal liberation and permission to be human. It’s still a place where people open their minds, hearts, and souls, a place where people come together in community to give and share with each other, where we grow and expand, and where we have meaningful and life-changing experiences. And, it’s still camping in tents and RVs in the middle of a desert of dust, with people engaging in conversation, dancing, eating camping food, and altered states. There’s almost three times as many people attending these days then there were fifteen years ago. The scale of the city is larger; it takes longer to get from one end of the “C” shape to the other. One aspect of the event being more popular is, of course, that it sells out each year. So, we can’t just (like we could back in the old days) take our time deciding to go or not and then buy a ticket whenever we feel ready – including, if we wanted, at the gate after the event had started. These days, instead, the process for getting tickets is usually more structured, complicated, competitive, and stressful, and often requires planning, strategy, persistence, and social networking to be successful. Many others have written at length about this change, so I will leave my observations at that. 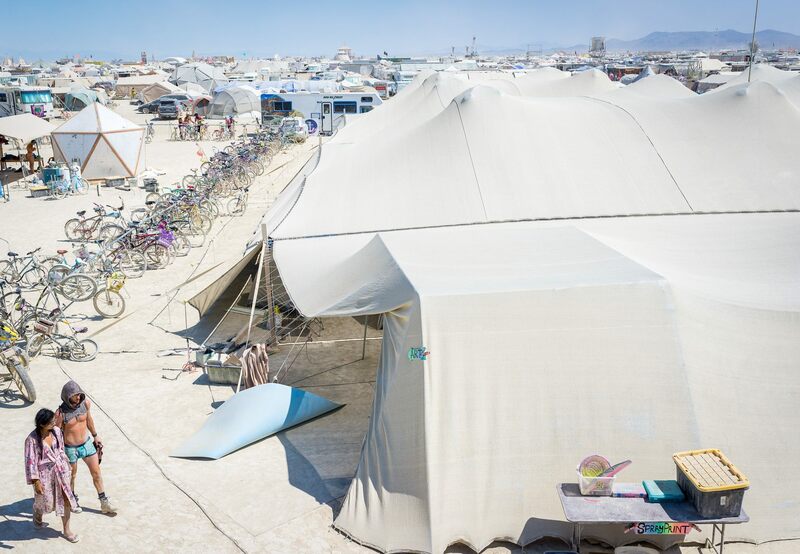 Relatedly, over the years, I’ve noticed that Burning Man contains more and more “stuff” – more art pieces, more art cars, more big sound systems, and more massive theme camps. It seems to me that, for every one big thing that gets retired, two more are introduced. There were three circles of art cars surrounding The Man on this burn night, instead of just one like there were fifteen years ago. The good side of that is, there are more “things to do” – more things to climb on, more fun and beautiful art to see, more food and booze offered and served, and more fun games to play. The bad side is that the space has gotten compressed, busy, and overwhelming. Not only are there more art cars and pounding bassline sound systems, but most have gotten louder and more visually dazzling in an arms race to capture the attention of the crowds. I feel unable to do some of my formerly favorite night time recreational alterations out there, because when I have tried to do them again, my sensory system has simply fried and sizzled with an unpleasant sensory overload. It has been disconcerting to me in recent visits that there has been no dark stretch of horizon to be seen when looking outward from the esplanade anymore – it’s been nearly impossible to visually tell where the two road and the ten road edges of the city ended and the “empty space” began, it’s been just one solid horizon of blinking colored lights. Similarly, it’s seemed to me like there is no more wide open deep playa to ride out to and just be with the stars, the silence, and your inner world any more – even apart from all the art car dance parties out there, now there is also an art installation every hundred yards, all the way out to trash fence. The art has gotten, for lack of a better word, “better”. It felt to me even more incredible than it used to be. One part of it is that, as I wrote above, there is simply more art out there, there are more people producing big and small pieces. Another part is that art tech – LED lights, motion sensors, visual/audio integration and sequencing, and more – has continued to advance and improve. And one more part seems to be that artists seem to have continued to develop a more locked-in sense of what “Burning Man art” is – for example, art that is meaningful, thought provoking, and moving, art that’s intentionally a fun midday hangout to escape the sun’s heat, and even more art that is specifically late-night-tripper-friendly than there used to be (which was, if you recall, a lot). (as an aside – as the years have gone on, just as recorded music has taken over an even larger role away from live musicians, electronic blinking lights have taken over much of the role of “visual dazzle” that big flumes of fire used to mostly provide). Each year, there seems to be more thought put into the experience, into making it more organized, convenient, and safe. Some people may not like this. For me, though, I feel that this is a great development (just as I felt happy when, for example, I saw that they first created orderly streets with street signs). One small example out of many is that there is now a medical station out in the deep playa, near the temple, so that anyone injured out there is aided more rapidly. Also, the mass automotive wait times at arrival and departure have been better thought out. Groups of cars now get “pulsed”, which means we get to turn off our engine for an hour at a time before moving onward (instead keeping it on for six hours to move forward fifty feet every few minutes). And there is a radio station broadcasting constant information on traffic and safety concerning the waiting lines and the paved road. Along the highway as one arrives, there are now products (clothes, bikes, glow lights) for purchase or rental, and, as one leaves, after parties with warm food and trash drop off. There are procedures and messages in place for safety in both directions. I love it that there are now more camps in BRC set up by Burners for Burners that anticipate what their neighbors might need and want: bars and snack food, of course, but also bike repairs, bike borrowing, bike donation drop off at the end, clothing swap racks, battery charging, tailoring and sewing, electronics repair, musical instrument repair, workout equipment, forgotten supplies providing, and playa wedding arrangements. 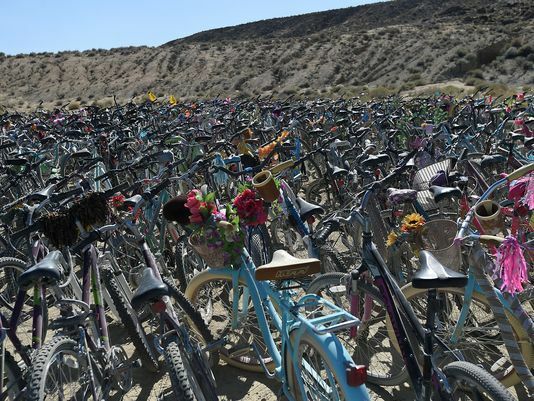 This year there was a large formal “spiritual emergence” (compassionate bad trip care) camp named “Zendo”, and a medical department called Psychs on Bikes providing mental health services too. There are now many more camps with schedules of classes, lectures, and experiential experiences that are of interest to Burners. The last few times I have gone, I have had the privilege of teaching just about as many huge mindfulness meditation classes as I have wanted, with other people providing the venue, infrastructure, and promotion (as long as I have remembered to reach out in May to class schedule coordinator folks). Almost all Burners seem to have been exposed to a packing list before they arrived, and known what to bring; for example, I did not encounter anyone who said, “Hey can you help me out, I completely had no idea before I got here that I should have brought my own [hot weather clothes / cold weather clothes / water / headlamp / dust mask / bike / etc]”. Fewer people camp in clumps of tents with a small group of friends than we used to. Many people camp in hexayurts and “shiftpods”, both of which are expensive (and, in the case of the yurts, more difficult to transport and construct) but are covered in reflective material for a comfortable temperature inside day and night, and are usually more spacious inside too. And a larger percentage of people camp in massive theme camps with shared infrastructure. And some of those camps seem to me to be extraordinarily well organized, with lots of infrastructure, services, organization, and gear, to an extent which would have seemed almost unbelievable fifteen years ago. The camp that we stayed with – “Camp Contact” – for example had about ten air conditioned domes, a massive kitchen serving two big meals per day (with six fridges, table space for twenty plus workers, and three running water sinks), a shower platform with four working spigots, metal racks for maybe five hundred bikes, a semi truck trailer filled with tools, a steam sauna with standing space for six or seven, a hardwood dance floor, and a 15k square foot aluminet shade structure canopy (with lighting and regularly-spaced power strips inside) that had about 150 people camping under it. I imagine that much of this stuff and the camp’s system to run it didn’t spring forth just this year, but instead has grown slowly from burn to burn. Nonetheless, seeing this year’s collection of gear and the camp’s level of organization was astounding to me. Phone signal out there is, however, one way that feels less positive to me about the increased “convenience”. I probably don’t need to explain how phone use at Burning Man can be distracting, addictive, closing, check-out-oriented, and contrary to the spirit of the event. There were times I noticed people looking at their phones – even when exciting, alive stuff was happening around them – and I felt let down. I do however feel that there are legitimate and pressing reasons for a person at Burning Man to text, call, email, or check the web. And mostly, it seemed to me that most people felt the Burner vibe and limited their phone use to inside their camp (if at all). Going to The Temple has become one of the most meaningful parts of a Burning Man visit for me. I have usually started crying within five minutes of first arriving there and starting to read people’s words of loss, remembrance, and hope. I felt especially moved this year seeing postings made by others for my recently deceased friends Jerry Candelaria, Preston Grant, and Staci Chitko (and also posting my own prayer-paper for Jerry, for my friends’ new baby, and for my new relationship). 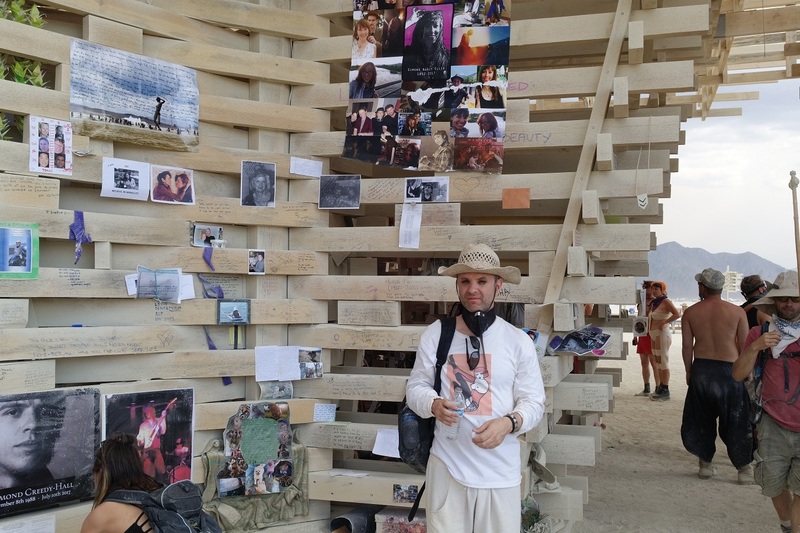 Fifteen years ago, it felt to me like The Temple was already starting to become as central to the soulfulness of Burning Man as the actual Man was. And I feel that The Temple’s emotional depth and weight has only expanded in the years since. One way that people now arrive at the event prepared is by knowing that grieving at The Temple may be a big part of their experience. So, many folks bring something to post inside the building, in some cases large, ornate, picture-filled memory boards (as well as sculptures, wedding dresses, soldier’s dog tags, and other primary artifacts). I mostly found this sweet and moving; I liked the care and love people put into their shrines to departed beloved souls. Many of the postings were for grandparents who died a natural death of old age and had no affiliation with Burning Man, and for pets. And while I feel compassion for people’s genuine and sincere grief, I felt more moved reading postings where the deceased had experienced an untimely young death and/or had been a burner, which I think is what almost all postings used to be. Also, I had a negative reaction seeing that some people who arrived early in the week had taken up a lot of the easily accessible posting space with big posterboards, leaving less space for others who arrived later to share their hearts’ messages. 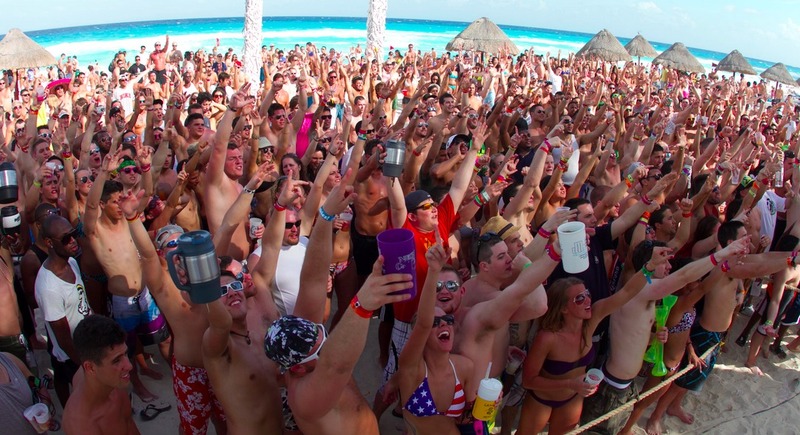 It used to be that anyone who arrived at the beginning of Burn week rolled onto a half-empty playa. Much of the big art was still getting built, with some artists spending most of their week out working at their pieces, illuminated by floodlights. 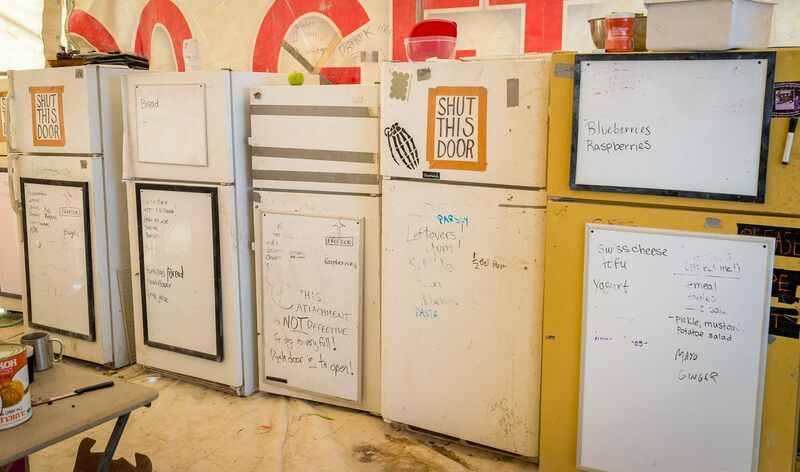 Group camps were also still setting up their shared infrastructure – which, along with the art pieces, provided opportunities for relatively new burners to jump in and help, contribute, and get to know folks. As people trickled in and set up their tents, night time social activity for the first couple nights focused on leisurely conversation sitting in camp chairs around burn barrels. The party energy only slowly built up as the city did, with a crescendo at the weekend, when the relatively crowded high energy disco extravaganza happened. Over the years, however, many people have wanted more of a Burning Man experience and have wanted to hit the ground running as soon as possible. And, since the Burning Man org has recognized that the city has gotten more complex and has taken more time to build, they have started giving out more early admission passes (currently called “Work Access Passes”) for people to come out before the main gates have opened and get to work. Because of these two factors, the city has become mostly constructed by the first official day, and, after big crowds have plowed in, a massive party has kicked off in full force right then on the first Sunday night – music pounding, art cars cruising, lights blinking, people flying high. These days, the partying has started earlier in the week: the first half of Burn week has felt to me like the heart of the celebration, as the time when the nights have felt more juicy, deep, pulsating, alive, and filled with wonderful possibility. Meanwhile, Friday and Saturday have come to feel more like a comedown, with the feeling in the air more sad, grabby, and tight, as people realize that their magic adventure is coming to an end. Another implication of more early admission passes given out is that there has been something of a bifurcation into (1) one group of people – many of them outside of the mainstream economic structure, often artists, often compensated with tickets – who have the time flexibility to be able to make Burning Man an extended two week visit, and who invest their effort and days of their time into creating the city, and (2) another group of people – most with more mainstream jobs and limited vacation time – who show up just for the one week, who pay full price, and who enjoy what others have built but don’t put as much time in themselves, and might not all appreciate the work it involved or feel as invested. For two decades now, every year, I have heard or read people lament that Burning Man has lost some of its heart, soul, and depth. I personally have never felt this before. But I actually did feel some of that vibe this year. 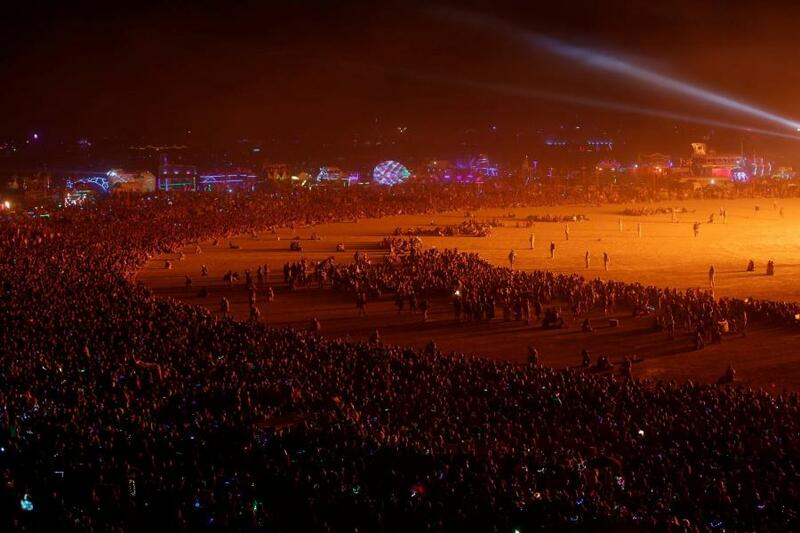 There did seem to be more first timer normies/muggles around, people who had perhaps seen reports about Burning Man in the media, and put it on a bucket list. There felt to me like more people approaching the event with an Vegas / Coachella / Daytona Beach spring break / Ibiza / Cancun / Phuket vibe. On Saturday morning, as the sun came up, I talked to a volunteer who said that some kids had just come up to her and said, “Hey man we just got here – where can we buy some beer?”. And the relatively new phenomena of “plug and play” camps, where wealthy people pay to be at a camp where compensated employees do all of the shopping, setup, cooking, and clean up (which I have never been aware of seeing, but have heard plenty about) are of course an extreme version of a Cancun vibe. 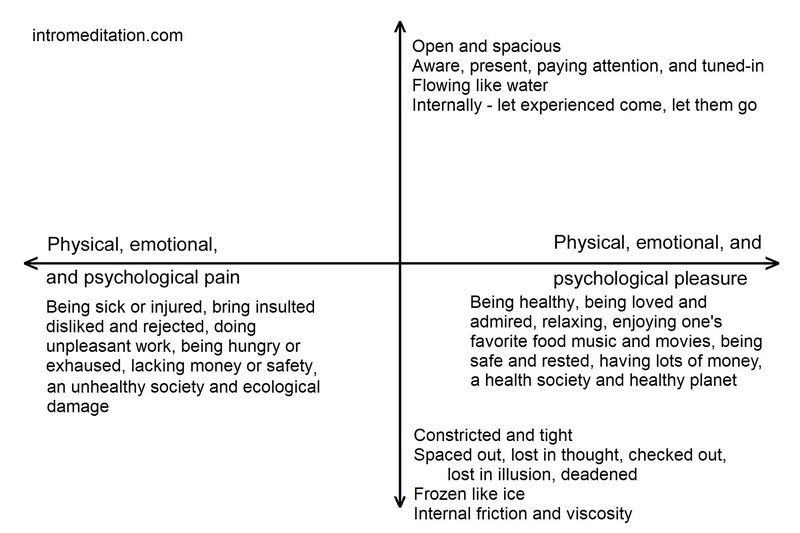 In my meditation classes, I often present a paradigm that there are two axes to human happiness. First, there is conventional human happiness – of course, we’d rather be healthy than sick, flush with cash than broke, approved of than disliked, and eating our favorite food than food we don’t like. I call this the “X Axis” of human happiness. And, as I see it, one of the meaning of Burning Man is that we go out there to do things that move us higher on the X Axis, the things that bring us conventional, normally-defined happiness: we get a buzz on, dance to our favorite music, whoop and yell, spend time with partners and friends, cruise for hook ups, enjoy blinkie lights, eat food we like, set up a roller rink (or a skate park or a gladiator battle dome), or whatever. But the meditative/spiritual awakening is to discover that there is another axis to happiness – how open we are with whatever we are experiencing. Are we spacious, accepting, allowing flow to happen, conscious, open-hearted, saying “yes”, and experiencing our humanity fully, or are we tight, compressed, addictive, arguing with reality, unconscious, and only partially experiencing life as it is? I call this question the “Y Axis” of human happiness. There is a way in which even normal pain and discomfort can have a rich, full, and even “pleasant” feeling to it if we experience them fully and with openness, i.e. if we are high on the Y Axis. When a spiritual teacher says, “You can be happy even when you are unhappy”, this is I think what they are talking about. 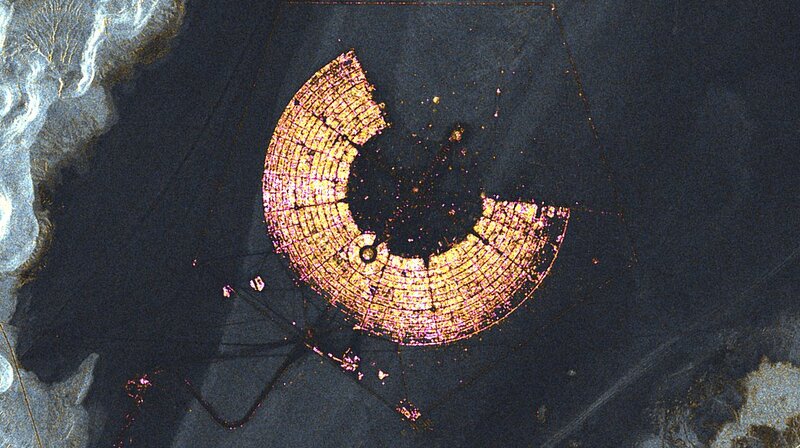 It feels to me that the not-so-hidden meaning of Burning Man is that it’s a place where we employ art, spiritual practice, chemicals, community, and love as tools to get high on the Y Axis, and open to the full spectrum of everything that is happening. It seems to me like many if not most new Burners show up with creativity, curiosity, openness, humanity, and depth. If enough people attend who are just there to get high on the X Axis, however, there to simply personally have a good time without being much aware of or caring much about the Y Axis, then that makes for more work for those of us who want the event to feel open, conscious, and soulful. Such is our spiritual/meditative work, I suppose; to do our best to generate a spacious, warm-hearted, and open vibe, no matter what other people bring or don’t – at Burning Man, and everywhere else we roam too. As I said (and as many people reading this know), fewer of my friends go than did fifteen years ago. People in their forties, fifties, and beyond – elder adventurers, festival veterans, artists, shamans, eccentrics, and others – have always been part of the Burning Man population. Many of these people it seems are disproportionately active during the day (involved with the art, volunteering, and classes) and more asleep in the early morning hours (with its altered states adventuring). But it jumped out at me this year that a clear majority of folks who go out to Burning Man are in their twenties and thirties, and seem to be looking for something. In many cases, they seem to be looking for experiences, fun, novelty, belonging and community, business networking, love partnership, meaning, and maybe also access to Y Axis spacious openness. I recognize that my burner friends and I were probably like that when we were younger. Many of us, though, as we’ve aged, have found some of what we were once looking for (or perhaps in some cases just gotten caught up in the grind of simple survival). Either way, many pals now have “committed adult stuff” to attend to – kids, careers, businesses, marriages and partnerships, projects, homes, ongoing spiritual/religious/therapeutic practices, and financial obligations – that precludes them from making it out. Other friends perhaps feel like they have gone enough times that it’s “been there done that”, and it’s not worth the large amount of time, money, and effort to make it out there again. And other friends seem to have fallen into mental health challenges, such that they don’t have the money or level of organization to make another visit happen. So, with maybe one quarter the number of friends out there and the total event population about three times as big, it’s less likely for me to bump into friends at random than it used to be. It’s also been harder to find a group of friends on purpose, since there are no more massive camps of twenty (or two hundred) of my friends camping all together; these days, it’s more friends camping individually with a bigger group of people who I don’t know, or, at most, together in a small pod. In general, it feels like my cohort has mostly passed the Burning Man torch on to younger generations. As may be obvious, I still love Burning Man, and I feel like attending it is a wonderful and valuable experience for anyone. 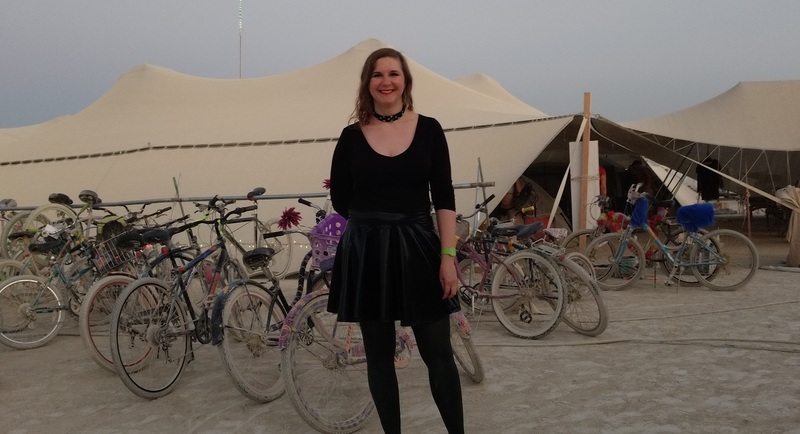 But like many of my friends, I also feel a while back, after say my first eight or ten visits, I had had enough of Burning Man that it stopped being as impactful as it had been (while still taking as much time, money, and effort to get to). I started to feel like I only wanted to make the pilgrimage out again if I had a compelling reason to do so. In the past ten years, I have gone back out there four times because I was drawn by two purposes: bonding and deepening with a partner for whom Burning Man was still fresh and new, and teaching meditation classes. After fulfilling both goals this year, I am feeling happy that I went.